Ashen haze over a somber city. The weather moves between rain and a delicate mist, the sun never quite in view as the buildings, sharp grey angles, are in the way. The hours are unending, the relief of tomorrow just out of reach. 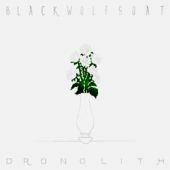 Such is the picture of Blackwolfgoat’s "Dronolith" an album that glides between (surprise) Drone and Instrumental Rock. At first glance, this album would appear to be a rip on Sunn0))) due to the title, and their influence on Blackwolfgoat is heard, but it falls into the instrumental/post/whatever rock category more and manages to find a voice different from O’Malley’s. Opening track ‘Ruane’ is a delicate staccato dance, creating lacey textures with the lo-fi recording and providing interesting contrast to the drone found later in "Dronolith". The influence of Red Sparrows and Earth can be heard throughout the album, making this an ideal pick for fans of said bands. Overall a good album that wasn’t difficult to finish, highlights being ‘Ruane’ and ‘Event Radius’. "Dronolith" isn’t treading on new territory, but it is taking the best route and ends up being a good choice for fans of Godspeed You Black Emperor, Sunn0))), The Gersch or Russian Circles.